Nieuwe Zorg was built in Gaastmeer, Friesland in 1908 during a time when the nearby shores were the saltwater Zuiderzee. 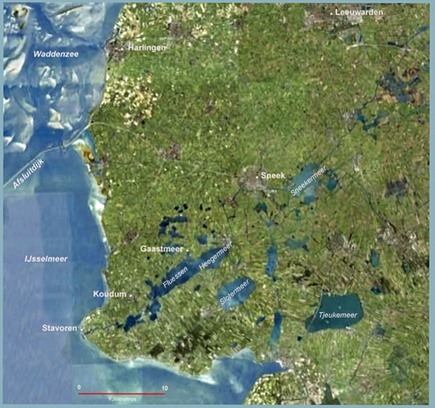 These waters led southward to the population centres around Amsterdam, Noord-Holland. Along the way, they also gave shipping access to the cities and towns along the eastern side of the Noord-Holland peninsula. 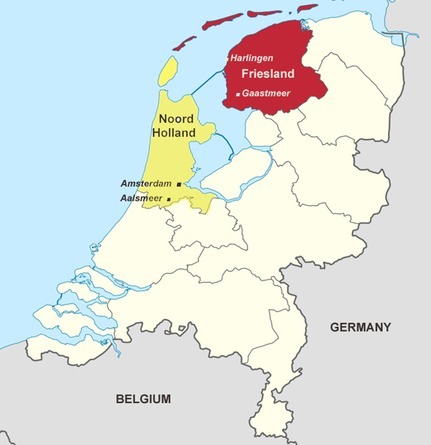 To the west and the north, the Zuiderzee led out to the Noordzee through a barrier of islands known as both Friese Eilanden and Waddeneilanden. These Frisian Islands, Wadden Islands or Wadden Sea Islands form an archipelago at the eastern edge of the North Sea in northwestern Europe, stretching from the northwestern corner of the Netherlands, along the German coast and up the coast of Jutland, Denmark. The islands shield from the North Sea a vast area of shallow mudflats in the Wadden Sea, large parts of which dry at low tide. Much of the Netherlands portion of the Wadden Sea has been declared a UNESCO World Heritage Site. It was to navigate and do commerce on the tidal waters of the Zuiderzee, as well as on the inland lakes, rivers and canals of Friesland that the design of the skûtsje had evolved. In 1932 the Afsluitdijk was completed between North Holland and Friesland, closing-off the southern portion of the Zuiderzee and forming the IJsselmeer. 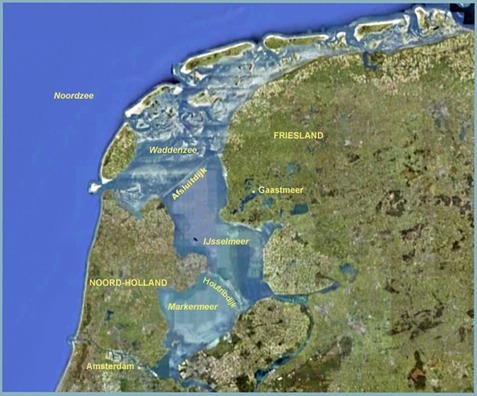 The IJsselmeer is named after the Gelderse IJssel, an important distributary of the Rijn. This branch of the IJssel River leaves the Lower Rhine southeast of Arnhem and flows northeastward for 113 kilometres to enter the IJsselmeer, which after the closing of the dike, slowly lost its salt and became a freshwater lake. It is a shallow lake with an average depth of 5.5 metres and a deepest point of only 7 metres. In 1975, with the completion of the Houtribdijk, the IJsselmeer was subdivided into two smaller lakes. The northern one retained the name IJsselmeer and the southern one was named Markermeer, after the island of Marken just offshore from the Noord-Holland towns of Edam and Vollendam. Sprinkled through the southwestern portion of Friesland are two dozen small lakes, which are interconnected naturally by rivers and streams, or artificially by canals. Among the larger ones are Fluessen, Heegermeer, Sneekermeer, Slotermeer and Tjeukemeer. A century ago, when our Nieuwe Zorg was built in the village of Gaastmeer, there were few roads in this area of Friesland; the main transportation was by boat. The village of Gaastmeer is located on a short arm joining the lake named Gaastmeer to one named Fleussen. Although there are now roads to Gaastmeer, it remains a tiny village, numbering fewer than 300 residents. Nieuwe Zorg was commissioned by Age Vaandriks of Koudum, a town about ten kilometres from Gaastmeer down the Fleussen and then along a canal toward the Zuiderzee. A later owner of our Nieuwe Zorg, Douwe Albert Visser lived in Stavoren, a town on the shores of the Zuiderzee at the mouth of the waterway that drains the Fleussen.